Operation Magic Carpet transported nearly 50,000 Yemenite Jews to Israel between 1949 and 1950. 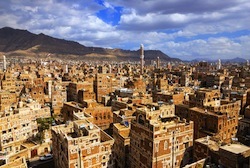 Today there are fewer than 350 Jews still living in Yemen which is a Muslim state. Yemen Jewish Penicillin uses a combination of spices called Hawayji to flavor the otherwise bland soup. Frying the chicken legs before adding to the soup pot does add depth and flavor. Typically, one leg and potato is offered per serving so this recipe is easy to multiply. The bland spices tend to make this chicken soup recipe perfect for pregnant women with colds in pregnancy. (Hawayji – 6 tsp peppercorns, 3 tsp caraway seeds, 1 tsp saffron, 1 tsp cardamom seeds, 2 tsp turmeric. Place ingredients in a spice grind and grind to powder. Store in airtight container). Heat water in a stock pot over high heat. Heat oil in skillet and brown chicken legs. Add chicken legs to now boiling water. Bring to a boil and skim foam from the top. Reduce heat to simmer, add potatoes, onions and coriander leaves and cook for 45 minutes. Add Hawayji to taste and serve. Pour warm water, yeast, sugar and salt into a large bowl. In a small pot, mix 3 cups room temp water and semolina. Add semolina water to the large bowl and mix together. The final dough will be thin not like traditional bread. Cover bowl and allow to rise for 3 hours. Pour 1 tsp of oil into a cold skillet, large. Spread a ½ cup to 1 cup of dough into the bottom of the skillet. The dough should cover the skillet evenly. Place over high heat and cover the skillet. When bubbles appear and the dough looks a bit dry reduce the heat to low and cook for an additional two to three minutes. The dough should be hard and golden brown on the bottom and dry on top – do not flip. Continue until all lachuhs are cooked.